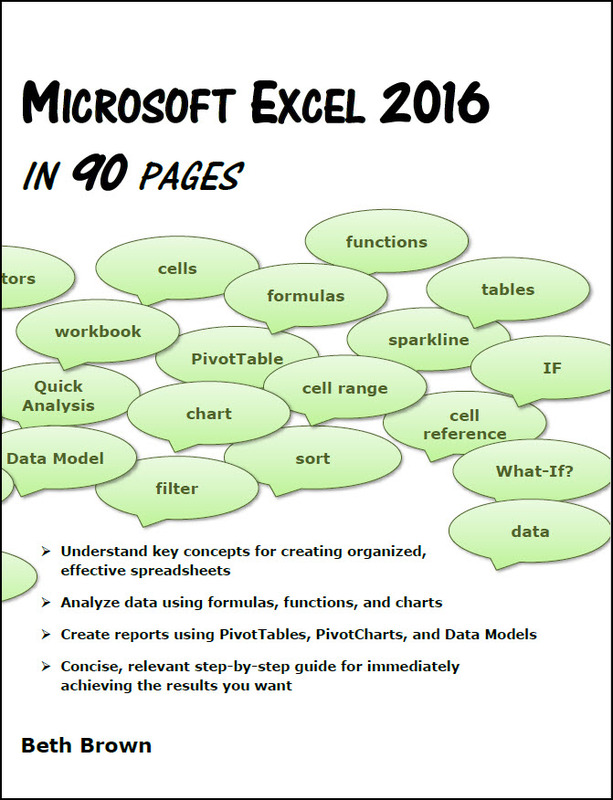 The essential guide, Microsoft Excel 2016 In 90 Pages ($8.95/$7.95) is now available at Amazon.com. Perfect for anyone using Microsoft Excel 2016 for Windows. Basic through advanced topics are covered for every level of computer user. Implement formulas, functions, charts, tables, PivotTable reports, and other advanced features. Create and format a spreadsheet using practices that optimize data analysis. Ensure accurate data with data validation and Excel’s AutoComplete, AutoCorrect, Auto Fill, and spelling checker features. Produce the most impact through conditional formatting and sparklines. Organize related data into tables that sort, filter, use slicers, have a totals row, and use calculated columns to analyze data. Visualize data relationships through charts, including pie, line, bar, treemap, waterfall, and stock charts. Use formulas and functions to generate new information. Perform What-If? analysis with scenarios, goal seek, and data tables. Generate PivotTable and PivotChart reports for tables and Data Models. Create Data Models by defining relationships between tables. Work more effectively by using multiple sheets, inserting cell comments, creating macros, and designing custom templates. Learn how to protect worksheet data and work collaboratively. I can’t wait to receive my copy of Microsoft Excel. I refer to “Microsoft Word 2016 in 90 pages” often. It is a great tool for me to use at work and at home! I am looking forward to reading the Excel book and having it available when I need it.